If this is your first time to order cowboy boots, please understand that cowboy boots fit a little different than regular adjustable shoes. Cowboy boots don't adjust like shoes with elastic or laces. Don't worry, we have fitted thousands of customers using this method. Handmade Cowboy boots made by different makers will all fit a little different. Boots are made on lasts (Nylon or wood shaped like a foot) and all of them are slightly different for each boot maker. Hand made boots of the same size and same manufacturer can vary slightly as well. This is due to different thickness and natural strength and flexibility of each different leather and other factors such as humidity, the boot makers strength on a particular day, as well as the toe style. You can measure your feet. DO NOT try to guess or order your tennis shoe size, or even the size of another boot manufacturer. We have had success in fitting about 98% of our customers right out of the box. We will work with you to get a boot that fits. The US size system uses numbers to indicate the length and letters to indicate the width. 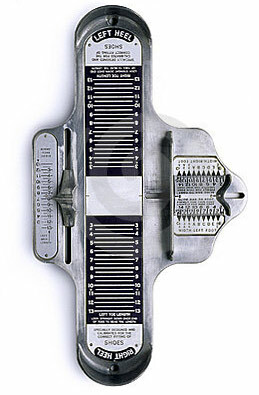 The Brannock Device you would find at any good shoe store is commonly used to measure sizes in the USA. The size system is linear. Men's size 1 is 7 2/3 Inches long and each additional size is 1/3 Inch longer. There are 9 widths in the US system. From narrowest to widest, they are: AAA, AA, A, B, C, D, E, EE, and EEE. The D width is considered to be "medium" for men and B width for women. The widths are linear and are separated by 3/16 of an inch however the actual width measurement which yields a D width varies with the length. You can determine your boot size and width using the following instructions and the tables below. The type socks you intend to wear with the cowboy boots. Feet swell slightly and get larger during the day, so measure later in the day. Left and right feet many times are a little different in size. Measure both feet and use the measurement for the larger foot. If sending in, do not Fax tracings! The fax will resize the tracing rendering it useless. Please have a friend do the tracing – don’t attempt to do your own. *See tip below. You must be sitting with your foot on a piece of paper or cardboard big enough to make a drawing around your foot. File folders are great. Draw the outline of your foot with the pencil held perpendicular to the paper at all times. Be sure to hold the pencil snugly against your foot. Measure the length and width at the points shown in the drawing. The drawing will be a little larger than your foot because of the pencil thickness. Subtract 0.2” from each measurement. This will give you a more accurate length and width. 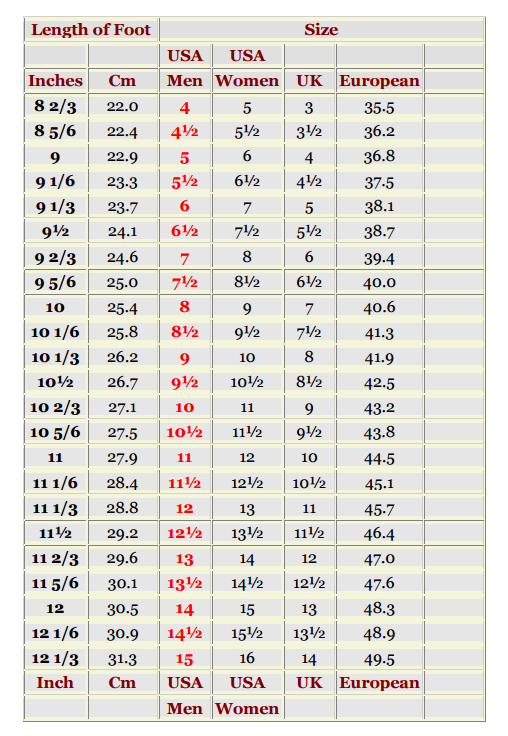 Look on the boot length chart and find the Men's US size. 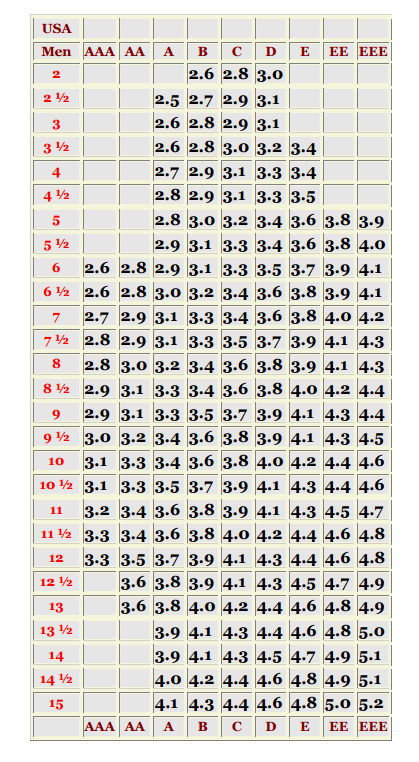 Next go to the Boot Width Chart with the Men's US size and find the closest width measurement on that row. Please also let us know if your instep is High, Medium or Low. If your instep is high or low, you probably already know this. If you don't know, you most likely have a medium instep. If you don't have someone to help with the tracing, many customers have found that you can put your foot between two flat, solid objects such as large books or bricks and then measure the length between. Do the same for the width. Do this for both feet. You do not need to subtract anything for the pencil thickness using this method. If unsure always go up in size and width, it's much easier to adjust too big of boots than too small of boots. Thick Socks and or padded insoles. Sizer Boots are available for most sizes & Toe and Heel Combinations for an extra charge. We recommend ordering a less expensive boot rather than an expensive exotic if you are unsure of your size. European sizes are usually whole numbers. In this chart they have been interpolated to show their closest match to USA men's sizes. USA Men’s Size is along the left. Go to the row for your size then find the width (in inches) on that row. The column head gives the width. To convert from centimeters to inches, divide by 2.54.